I have this problem right now. I’ve been trying to cut down on discretionary spending (especially recurring payments). This means no Netflix and even my precious gym membership is on hold. It also means my Audible membership has been canceled. In case you’re unfamiliar, Audible is Amazon’s subscription audiobook service where each month you pay $14.95 in exchange for one credit which can be used to purchase almost any book in their store. My problem isn’t that I’m tight on finances; no, my problem is that there is an audiobook that I really, really want but I have no credits to buy it. Now I have the dilemma: do I pay for the book with fourteen dollars and ninety-five cents out of my pocket, or renew my subscription and use just one credit to get the book. I know that my balance sheet would be the same at the end of the month, but I can’t bring myself to outright buy the book with money. In my mind, books are paid for with credits which feel so much cheaper than the entire dollar amount of a book. I know it’s not rational, but it is behavioral economics in action. Humans are irrational, but that irrational behavior follows patterns. Behavioral economics follows those patterns by looking how psychological, emotional, and social factors shape the decisions people make. And while economics may not be your favorite topic, getting some conversions from paying attention to these principles is certainly worth your time. If Amazon ignored behavioral economics and instead applied theories of rational decision making, they would probably try to remarket to me after looking at that book or attempt to hook me by telling me how good reading is for the brain. Those tactics probably wouldn’t have resulted in a sale — which Amazon knows, and instead uses behavioral economics to avoid the “pain of paying” to make the purchase seem less tangible with a credit program. Ready to make the switch to following these behavior-based principles, but don’t know where to start? There are a few methods you can use in your sales and marketing strategies to ramp up customer loyalty, and there’s a good chance you’ve already seen some of them around. That limited edition widget looks so much better than the identical not-limited-edition one. Why? Scarcity makes things seem more valuable and people are afraid of regretting missing out on a good opportunity, which can make limited time or special edition messaging effective. Where have you seen it? Take the recent sensation of Kylie Jenner’s cosmetics line as an example. Her store’s releases of “limited edition” collections both this summer and fall sold out in under 30 minutes — thanks to a lot of hype around limited inventory and single-edition collections. How can you use it? Since just telling someone to “act now” isn’t very persuasive, try adding scarcity with a limited time frame (“this week only”) or limited quantity (“only 20 available”). Just as a word of caution: be sure these are backed up with actual limits and not just words without meaning. Have you ever heard “fake it till you make it?” And when you decided to be a gym-goer as your new year’s resolution, what kind of clothes did you buy? Social perceptions are a big incentive when it comes to consumer action, and buyers’ opinions of how your product with affect their own reputation can stimulate (or kill) a sale. Where have you seen it? 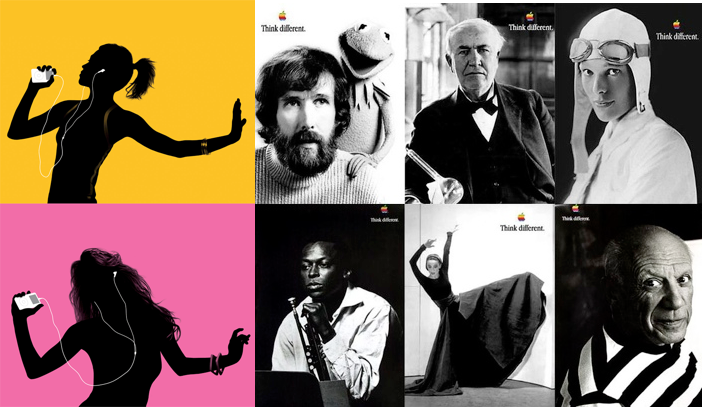 Apple is known for making products for individuals who think differently and who do not follow the status quo. When buying their products, consumers are not just buying a device, they are buying a reputation and statement to others as well. Despite shoppers being savvier than ever, there is still a gap when it comes to purchasing unfamiliar products. Anchoring is a tactic which attempts to fill that gap for customers by giving them a pricing reference point (and then comparing your price or value to that to make you seem more appealing). Where have you seen it? 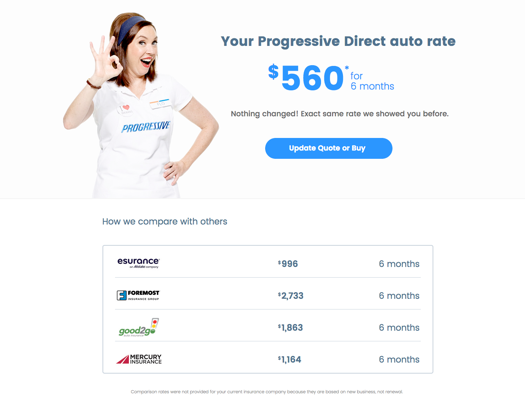 Progressive Insurance is famous for this with their rate comparison tool. To create a reference for where their benefits and rates are relative to the market, they have a “Compare & Save” tool to show what other competitors have to offer. How can you use it? Compare your products to prices of other competitors or put in a feature grid to show where you fall in the spectrum. Help educate your visitors on what other options are out there and the cost of those options, with the limelight falling on what you have to offer. Herd behavior (where people just follow what the group is doing instead of acting on independent thought) is not just for peer-pressured teens. Social proofing is a powerful tactic where information on how others behave (“the herd”) is used to create influence at an individual level. After all, if someone else “just like you” is doing it, don’t you want to as well? Where have you seen it? Charity Water has been highly successful using social proof in their campaigns. They show images and tweets of other donors, and plug numbers across their site of how many others are taking part in the movement. How can you use it? Testimonials are a great way to gain trust and prove you are authentic. Take it a step further with numbers for how many people are trusting you and by showing success stories from people who resemble your target market. I will end on a word of caution to execute these strategies with class. Users may be susceptible to irrational behavior, but they will also lose all trust if they feel manipulated. Remember the goal is to achieve a conversion that is mutually beneficial to you and the user, and this is not trickery to influence users into doing something they don’t want to. See, applying human psychology can be fun after all! Try out one, two or all of these — and there are plenty of other behavioral economics heuristics you can apply too. My favorite angle is using these when creating user persona types to group actors based on what behaviors they exhibit. Want help finding your favorite? Let’s do it — schedule a chat now.